Rosehip oil(certified organic), camellia oil, peach oil, apricot kernel oil, macadamia oil, carrot infused oil, centella oil, avocado oil, hypericum oil, evening primrose oil, vitamin A, vitamin E, rosemary antioxidant, essential oils of rose maroc absolute, frankincense, german chamomile (certified organic), rose geranium and lavender. Free from sodium lauryl sulphate, parabens, propylene glycol, synthetic preservatives and artificial fragrances. 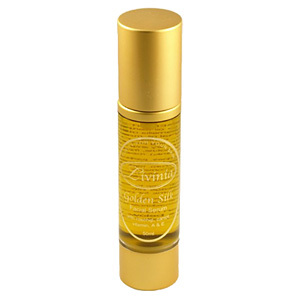 A high performance oil based serum, high in essential fatty acids, vitamins and antioxidants. Vitamin A and E help reduce free radical damage and help reduce the appearance of ageing. Easily absorbed and extremely hydrating, Golden Silk Facial Serum leaves the complexion feeling soft and silky with a healthy glow. Suitable for all skin types particularly dry, mature, stressed, sensitive and sun-damaged skin.